The 24 metre sailing yacht All Smoke, jointly listed for sale by Pegaso and Camper & Nicholsons International, has been sold with Pegaso introducing the buyer. Built in composite with carbon fibre reinforcement and epoxy resin by South African yard Southern Wind Shipyard to a design by Reichel-Pugh, she was delivered in 2004 as the fourth hull in the SWS 78 series. A thorough refit in 2015 saw her carbon fittings checked and overhauled and a new teak deck fitted, while her hull, superstructure, mast and boom were repainted. An interior in natural teak veneer by Nauta Design accommodates six guests in three cabins consisting of a master suite forward, a double and a twin, all with en-suite shower facilities. In addition, there are quarters for three crew. The full-beam saloon offers a dining table with seating for up to 10 guests, a sociable L-shaped conversation area and essential luxuries, including a fridge, an ice maker and a wine cooler. Her distinguished career as a cruiser/racer includes winning the 2005 Palma Superyacht Cup and she was also winner of Mini Maxi Rolex World Championship Cup in 2011. The uncluttered deck plan features a large guest cockpit, a relaxing sunbed area and a separate sailing cockpit with dual steering wheels. Under power, a 230hp Yanmar diesel engine gives her a range of 1,800 nautical miles when cruising at nine knots. 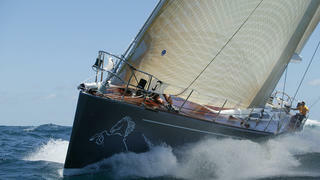 All Smoke was asking €2.1 million and is renamed Ocean Horse.